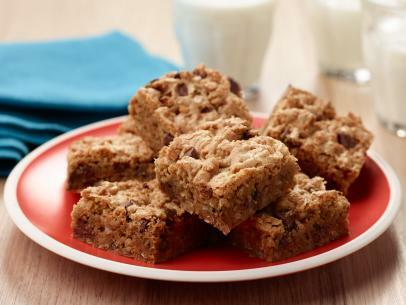 These bars are reminiscent of a chocolate chip cookie, but better. Browned butter and brown sugar add a subtle butterscotch flavor, and coconut keeps the insides extra-gooey. Preheat the oven to 375 degrees F. Butter and flour a 13-by-9-inch glass baking dish. Place the sugar in a large bowl. Cook the butter in a small skillet over medium-high heat, shaking the pan occasionally, until the foam cooks off, the bubbles become smaller and the butter begins to brown, about 7 minutes. Remove the pan from the heat when the butter is golden and the solids are a nutty brown. (The butter will continue to darken off the heat.) Let cool 5 minutes. Beat the browned butter into the sugar until the sugar is fully moistened and looks like wet crumbs. Meanwhile, in another medium bowl, whisk together the flour, baking soda and salt. Beat the eggs and vanilla into the brown sugar mixture. Add the flour mixture to the brown sugar mixture a bit at a time, and mix until a smooth, thick batter forms. Fold in the chocolate chips and coconut. Press the batter into to the prepared dish and spread to evenly fill it. Bake until the bars are light brown around the edges, the center is set and crackly and a toothpick inserted in the center comes out with slightly moist crumbs adhering, about 25 minutes. Let cool for at least 1 hour. Cut into squares and serve.